Annapolis, MD – This past weekend, the DRFC traveled to Annapolis for a quarterfinal Varsity Cup match against the winner of the 2013 Inaugural Varsity Cup, Brigham Young University. BYU also had won the 2009 and 2012 Collegiate National Championship so the Dartmouth squad knew they were facing a formidable opponent. The match was played at the Navy Marine Corps Stadium which provided an inspiring setting for the contest. Although Dartmouth battled and stayed close in the first half, BYU’s offensive juggernaut, led by flyhalf Jonny Linehan with 25 points, took off in the second half on their way to a 70-15 victory. Strong defensive play by Dawit Workie, Andrew Berson, Wilson Chockey and Madison Hughes led to a close first half where the score was 8-3 in favor of the Cougars before a half-ending BYU try brought the tally to 15-3 going into the break. Despite a few highlight-reel second half runs resulting in tries for Workie and Hughes, the BYU forwards controlled the play en route to a commanding win. BYU will host Navy this Saturday in one semifinal while Cal hosts Central Washington in the other semi. Coach Gavin Hickie commented on the match and the spring XVs season. 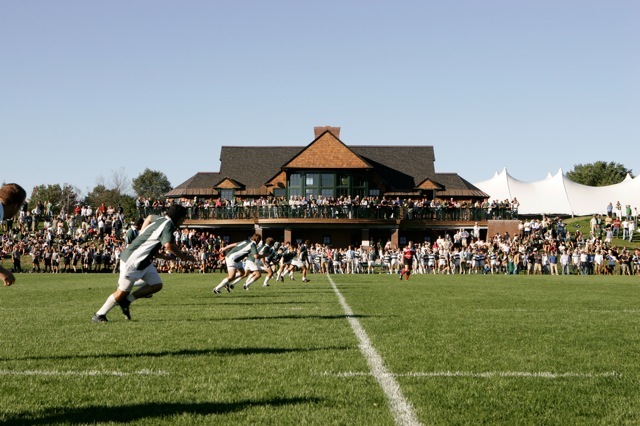 The Dartmouth Rugby Football Club now embarks on five weeks of training and preparation for the Collegiate Rugby Championships, the nation’s premier collegiate 7s tournament, May 31st and June 1st at PPL Park in Philadelphia.